Please be seated by 4:45 PM. Please join us for tea after the Poetry reading session. 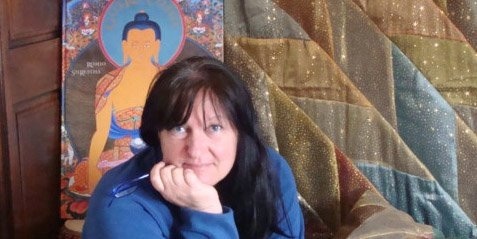 Martine Le Cam, artist, painter, poetess and a creative guide to literary workshops, was born near Paris, France in 1962. Her family, especially her renowned artist maternal-grandfather, Maurica Vogt, gave an aesthetic shape to her early years. Since her childhood she has lived in Golfe of Saint-Tropez that always inspires her for writing and painting. Solitary walks and meditation in the hills of Maffis des Maures opens spiritual domains in her life. Moreover, the eternal nature and inherent silence of woods lend a lyrical flow to her paintings and varied pictorial images to her poems. Exhibitions, of her paintings, have followed wherever she has traveled. Martine richly reflected the spirit of her region Massif des Maures in her works, including her exclusive book “Frere Antoine, ermite de l’ordre du jour” Ed. Campanile. Beyond all kinds of dogmas and religious prejudices, she is deeply touched by humanitarian, spiritual and mystic dimensions of Indian culture. She likes to spend more and more time in India and work with her counterparts. Bhai Baldeep Singh 09810002653, Dr. Swaran Singh 09815979148, Narindar Singh Sonia 09855624711, Sr. Baljit S Randhawa 09888480333, Dr. Harjit Singh 09815022500 and Ravinder Rocky 09855306070.